Why English wild flower essences? Deeply woven into this landscape is a concentration of healing energy found in Nature. The mountains, coastlines, ancient oak forests and countryside of this isle hold great beauty and also the key to this healing. Our ancestors knew of this wisdom and built great stone circles not only to understand the cosmos but also to focus Earth’s healing energy. When we use medicinal plants and flowers from where we live can provide a unique synergy to their healing properties. English Wildflower essences are steeped in the healing wisdom of this land, from which we can now benefit. What is an essence, and how does it work? An essence is the energetic signature of either a flower or mineral. Spring water is used as the carrier for this signature and traditionally brandy is used as a preserve. There are many different ways to produce essences. Wildflower produces ‘living flower essences’ from a plant where the flower has not been picked or cut. The essences are drawn from flowers that are still attached to the plant and its roots - drawing on the energy from the whole plant and the environment in which it resides. Great care is taken to find the right location of each wild flower so the healing properties of the Earth can be gained too. 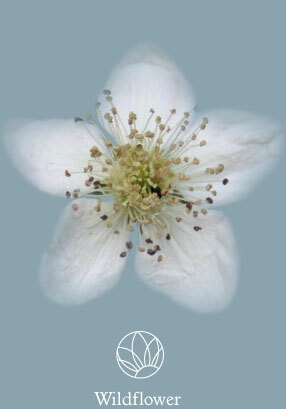 The wild flower essences work in harmony with our bodies, which are electric. The nervous system and our thought patterns generate energetic impulses. The essences are an energetic key that can help unlock the body’s healing abilities. Traditionally glass bowls are used in producing flower essences; at Wildflower we use crystal geodes, which can help amplify the energetic signature of the wild flower, and infuses the mineral’s essence into every tincture. The combination of wild flower and mineral essences can offer deeper healing than singly. The crystals geodes used are Bluelace Agate, Clear Quartz, Celestite and Rose Quartz.